No matter how old, we all love to feel a sense of achievement! At Swalings we celebrate success and progression with our unique Swalings badge scheme. From a practical perspective, the badge scheme provides pupils with a structured, engaging and dynamic scale of development to recognise their growing ability in Football skills, stamina and ability. Younger children begin by learning the more basic skills required to play football as ‘Little Dibblers’ and can work their way up to the ‘Match Skills’ level whilst becoming confident, skilled Football players. 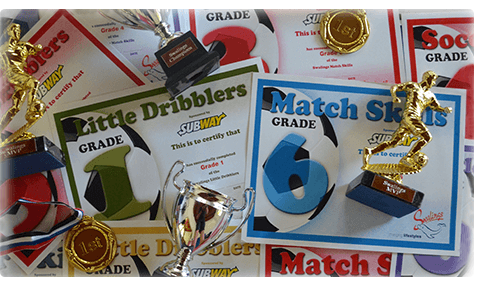 There are 3 levels of progression: ‘Little Dribblers’, ‘Soccer Skills’ and ‘Match Skills’. The skills learnt throughout the badge scheme are aligned to a young person’s natural cognitive advancement to support their personal development and enhance their social and interactive skills. We are keen to make sure that ever pupil progresses with confidence to ensure that they gain the knowledge and technical understanding in practise. This badge level is aimed at children ages 1 – 4 and 4 – 6 and has 6 stages of learning. The key focus is to support your child’s cognitive development whilst enabling them to learn new skills to enjoy football. We run activities that enhance their listening ability alongside fun, interactive exercises that strengthen their spatial awareness as coordination. Our next level of progression is ‘Soccer Skills’ and has 6 stages of learning. This level focusses on establishing and developing the child’s technical skills such as dribbling, catching and passing. We continue to build upon their social skills and sporting etiquette as well as their playing and self-confidence. Our ‘Match Skills’ level also has 6 stages of development. This level is taught using real life match scenarios and focuses on the finite skills used in competitive football such as ball control and target shooting.